Formed in 1987 the objectives of Vintage Arms Scotland are to encourage an interest in muzzle and breech loading firearms; to promote, regulate and safeguard their use; to preserve their freedom of collection. 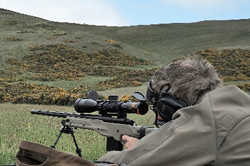 The Club is affiliated to the National Rifle Association (NRA), the Muzzle Loaders Association of Great Britain (MLAGB), and is the host for the Scottish Historical Rifle Championships. The Club is a very friendly one and has a membership covering all ages and professions, including a number of family, lady and junior members. For more membership details, click here. In line with our interest in muzzle and breech loading weapons, our members own a wide variety of firearms. These range in age from muzzle loading muskets through to 'newfangled' modern breech loaded brass cartridge firearms!! To enable us to quickly contact our members and friends - and keep everyone up-to-date - please join our mailing list.